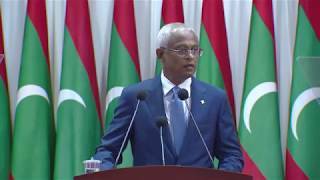 President Ibrahim Mohamed Solih has delivered his first Presidential Address this morning, at this year’s opening session of the People’s Majlis. The opening session was held at Dharubaaruge this morning. 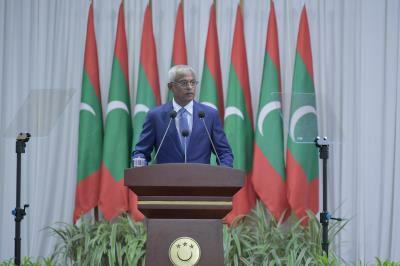 In his address, President Solih noted that his time of assumption of office was at a critical juncture in the history of the Maldives; where the political landscape was in turmoil and the country’s reputation marred. He highlighted that the country’s social fabric was torn and in disarray, and the political opposition and scores of citizens working for reform either were jailed or trapped in unlawful sentences. The President stated that however, today his administration has re-embarked on a national journey towards democracy, restoring the basic rights of citizens including their constitutional right to pursue political activity and political dissent, leading to a rise in people’s contentedness. In his Presidential Address, the President said that the people elected him in the hopes of moving away from the culture of corruption and kleptocracy that was poisoning the Maldivian nation, and happily noted that we’ve steered the vessel of the nation towards a life of dignity and integrity for every citizen. He said that his administration’s utmost priority is to establish peace and stability within the society. President Solih further reiterated his assurance that the Government will not forget, or falter in its efforts to deliver on the promises to the people; to realise the people’s hopes such as providing affordable housing, clean water and adequate sewerage. The President also reaffirmed his administration’s commitment to govern within the confines of the constitution and the laws of the land, saying that every aspect of administering the Maldivian State is geared towards ensuring the rights of the people, establishing social justice and improving livelihoods and wellbeing. This year’s Presidential Address also highlighted the many changes required to be brought to the administrative framework of the Government in order to realign the State to function as a democracy. Noting that the past four years saw the Majlis stripped of its ability to carry out its constitutional duties, President Solih underscored that in order to reform the democratic system, the work of the People’s Majlis must be improved and strengthened. Further, President Solih also spoke on the urgency to reform the judiciary in order to guarantee the rights of the people, and assure them that justice and freedom will prevail. He stated that the courts and judges must take the road to reform if we are to see any peace and stability in this country. Highlighting the pressing need to fight corruption in the country, President Solih noted that at the time of his inauguration, there was not a single State organ free from the endemic corruption that maligned our nation. He noted that there was not one State organ in this country that had not endured varying degrees of deceit and embezzlement. Continuing in this regard, the President underlined that the country fell into this lamentable situation not because of an absence of anti-corruption laws and regulations but because of inaction. He pointed out that institutions with investigating and prosecuting cases of corruption carried on as if the status quo was the norm. In his address, President Solih noted that the Commission on Corruption and Asset Recovery he has established, to reclaim embezzled assets and money, has convened its work with technical assistance from foreign experts, and has the full support of a number of government agencies from various countries. He said that the goal is to recover the lost funds, and bring to book those responsible for acts of fraud and theft in accordance with the law. The President also spoke on the works of the Commission on Investigation of Murders and Enforced Disappearances, stating that the commission is currently focused on seeking assistance from forensic experts and Artificial Intelligence experts to investigate photos and videos gathered as evidence, and achieve tangible results. 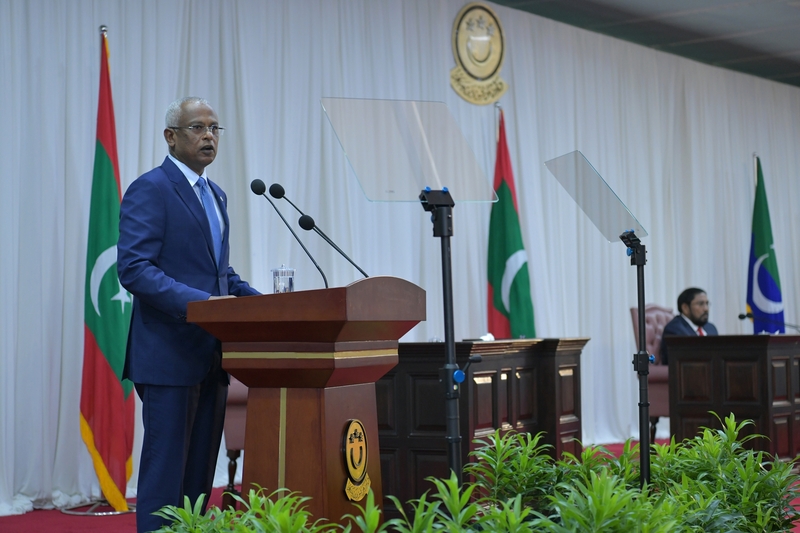 President Solih further noted that necessary reforms are currently underway to ensure close provision of police protection required for the peaceful and contented life that Maldivians envision, and to eliminate organised crimes and violence. To this end, he said that neighbourhood police will be introduced, which is a new initiative that will also be extended to the atolls this year.